The Year of the Wood Horse! The Chinese New Year is celebrated at the turn of the Chinese calendar, which is a lunar calendar. Why this "calendar" is so important to me, I will explain in another article entirely, but suffice it to say that it caught my interest when I read this article about "Makara Sankranthi" - a festival celebrated in India - by one blogger whose blog posts I absolutely love to read. The Chinese New Year falls on the second new moon after the winter solstice. It is also known as the "Spring Festival", and it is supposed to indicate the end of winter and the beginning of the fertile season of spring. Legend has it that there was a monster who preyed on villagers, and the name of the monster was "Nian" (which is also the Chinese word for "year"). The story says that a wise man counselled the villagers to ward off Nian by beating drums (causing loud noise) and by handing red colored paper cut-outs on their doors, because Nian is scared of the color red. The villagers took the wise man’s advice, and warded the monster Nian away. The day they managed to ward the evil monster came to be celebrated as the “New Year” and it continues to be celebrated every year since. The traditions followed by the Chinese still resemble what the legend has to say. They celebrate with their family, by hanging red-coloured scrolls on their doors, with the dragon and lion-dances on streets (with loud noise). It is also tradition to give money to children in red envelopes. These traditions apart, they have the regular meet-and-make-merry that most festivals have as a part, and today, January the 31st , 2014 - is the second new moon after the winter solstice (again, as per the lunar calendar!). The Chinese zodiac consists of twelve animals, and each year is named after an animal. 2013, which was the year of contemplative action- the year of the water snake - has passed by. 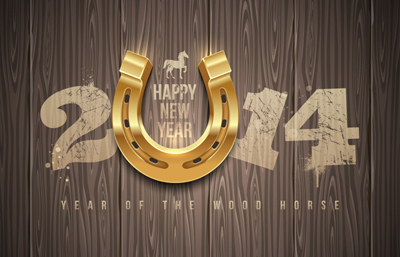 2014 is the year to gallop away to glory with decisive and fast actions, for it is the year of wood horse! Any facts, figures or references stated here are made by the author & don't reflect the endorsement of iU at all times unless otherwise drafted by official staff at iU. This article was first published here on 31st January 2014.